Freenet organizes nodes by giving them locations - like coordinates. The nodes know some others and can send data only to those, to which they are connected directly. If your node wants to contact someone it does not know directly, it sends a message to one of the nodes it knows and asks that one to forward the message. The decision whom to ask to forward the message is part of the routing. And the routing algorithm in Freenet assumes a small world network: Your node knows many people who are close to you and a few who are far away. Imagine that as knowing many people in your home town and few in other towns. There is mathematical proof, that the routing is very efficient and scales to billions of users - if it really operates on a small world network. The probes project from Steve is to analyze the structure of the network and the structure of the local connections of nodes in an anonymous way to improve the self-organization algorithm in freenet. The reason is that if the structure of the network is no small world network, the routing algorithm becomes much less efficient. That in turn means that if you want to get some data on the network, that data has to travel over far more intermediate nodes, because freenet cannot determine the shortest route. And if the data has to travel over more nodes, it consumes more bandwidth and takes longer to reach you. In the worst case it could happen that freenet does not find the data at all. Low is an ideal structure with 16 connections per node, Conforming is the measured structure with about 17 connections per node (a cluster with 12, one with ~25). Ideally we would want Normal with 26 connections per node and an ideal structure. High is 86 connections. The simulated network sizes are 6000 nodes (Small), 18 000 (Normal, as measured), 36 000 (Large). Fewer hops is better. It shows how many steps a request has to take to find some content. “Conforming” is the actually measured structure. “low”, “normal” and “high” shows the number of connections per node in an optimal network: 16, 26 and 86. The actually measured mean number of connections in freenet is similar to “low”, so that’s the bar with which we need to compare the “confirming” bar to see the effect of the suboptimal structure. And that effect is staggering: By default a request needs about two times as many steps in the real world than it would need in an optimally structured network. Practically: If freenet would manage to get closer to the optimal structure, it could double its speed and cut the reaction times by factor 2. Without changing anything else - and also without changing the local bandwidth consumption: You would simply get your content much faster. If we would manage to increase the mean number of connections to about 26 (that’s what a modern DSL connection can manage without too many ill effects), we could double the speed and half the reaction times again (but that requires more bandwidth in the nodes who currently have a low number of connections: Many have only about 12 connections, many have about 25 or so, few have something in between). Essentially that means we could gain factor 2 to factor 4 in speed and reaction times. 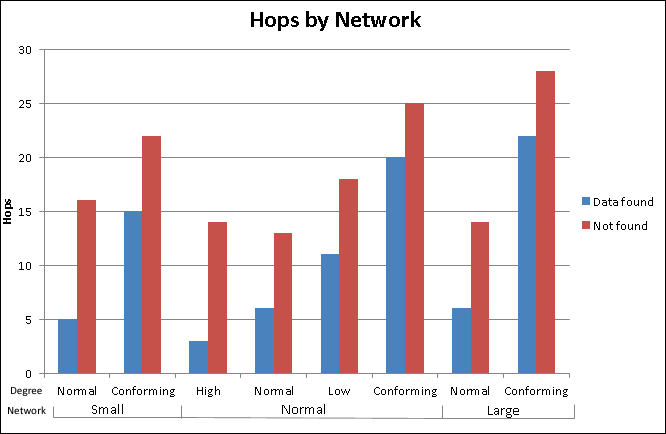 And better scaleability (compare the normal and the large network). To achieve a good local connection-structure, the node can use different strategies for Opennet and Darknet (this section is mostly guessed, take it with a grain of salt. I did not read the corresponding code). In Opennet it can look if it finds nodes which would improve its local structure. If it finds one, it can replaces the local connection, which distorts its local structure the most, with the new connection. In Darknet on the other hand, where it can only connect to the folks it already knows, it looks for locations of nodes it hears about. It then checks if its local connection would be better if it had that other nodes location. In that case, it asks the other node if it would agree to swap its location with it (without changing any real connections: It only changes the notion where it lives. As if you would swap the flat with someone else but without changing who your friends are. Afterwards both the other one and you live closer to your respective friends). In short: In Opennet, Freenet changes to whom it is connected in order to achieve a small world structure: It selects its friends based on where it lives. In Darknet it swaps its location with stranges to live be closer to its friends.